What do George W. Bush, Donald Trump, Anthony Weiner, Vladimir Putin, Kim Jong-un, Waco Texas biker gangs and most dogs have in common? They all receive messages from Sirius, the Dog Star. Have you ever noticed how dogs will stop and tilt their heads to one side with a quizzical look? They are receiving instructions from Sirius. My new little puppy assumes this stance before going into psycho-puppy mode. Eventually, she is ordered, by extra-terrestrial powers, to relax and assume the adorable puppy mode. George W. Bush assumed a similar position before he was instructed to invade Iraq. Yes, you read it here first. Bush 43 did not decide on his own to invade Iraq; he was ordered to do so by forces in the universe. Sometimes the orders get mixed up. 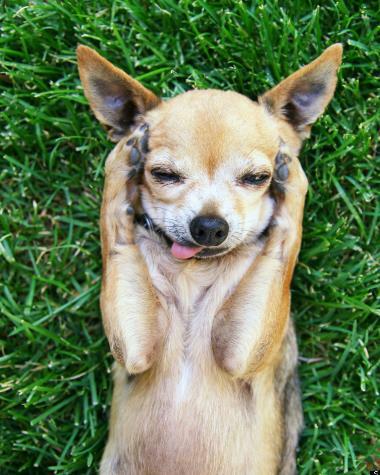 Not a month ago, several would be presidential candidates were caught attempting to lick their privates while, on the same day, a bunch of dogs declared their candidacy for President of the United States. Donald Trump got both orders simultaneously. Anthony Weiner received a similar mixed up message which instructed him to do different things with his – uh – thing. And then there is the leader of Russia, one Vladimir Putin. 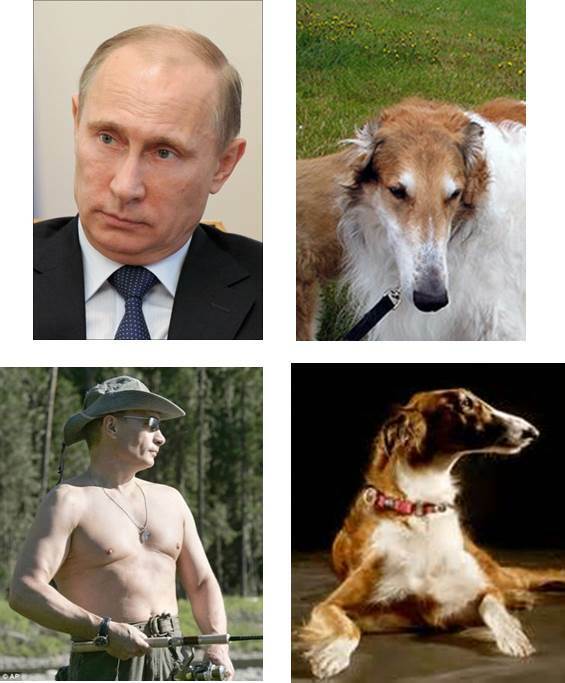 Is it not more than coincidence that Putin and a Russian wolfhound look alike? 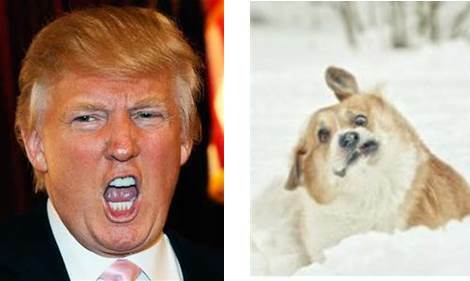 Both have “dog star receiver” written all over their faces. Both have the mannerisms and actions to support this theory. When Putin mysteriously disappeared for a period a time, the journals were abuzz with rumors about his absence – a coup, super-secret negotiations or a covert liaison? No, he was getting a much-needed flea bath and toe trim ordered by interstellar forces. 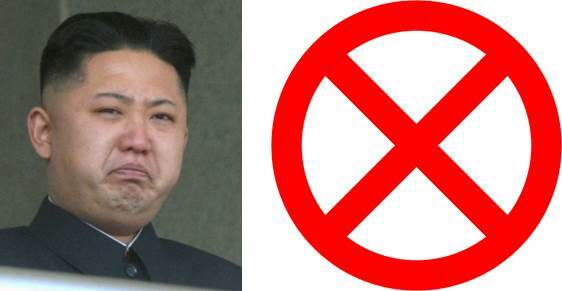 Then there is the supreme leader of the Democratic Peoples’ Republic of Korea, Kim Jong-un. There is no comparable picture of a dog because 1) it’s disrespectful to all dogs and 2) Kim would have the dog convicted of disloyalty, executed and then eaten. Last, and certainly least, are the biker gangs of Waco, Texas. You probably concluded that the recent deadly incident involving a bunch of biker gangs revolved around drugs, alcohol and high testosterone levels. Wrong! They were actually fighting over the economic policies of the former late president of France, Valery Giscard D’Estaing. At the same time, at an economic summit, economists fought over a dog bone. These stated items are just a few of the many occurrences that have been influenced by forces from outer space. In fact, this phenomenon is so common that I am amazed it has not been canonized into law. Just fooling with our minds? Testing their version of the emergency broadcast system? Attempting to enroll in Obamacare? Creating their own type of intergalactic PlayStation? Playing interstellar fantasy space balls? No one knows. Unless you know. Of course, you may be receiving orders as well. This entry was posted in Peculiar Science and tagged biker gangs of Waco, Dog Star, Donald Trump, George W. Bush, Giscard D'Estaing, humor, humour, Kim Jong-un, musings, peculiar behavior, science, Sirius, Vladimir Putin. Bookmark the permalink. This is the best explanation I’ve ever heard about Putin and Trump! LOL, thank that was great. I and the Dog Star thank you. – You joke, but I would not be surprised if this were true. Great post! If you look carefully, you’ll notice that he now wears a flea collar. Well, now it makes perfect sense. Which is good, because any world in which Donald Trump might be president needs all the sense it can get. And luck. Lots and lots of luck. I may be wrong about The Donald. He may be responding to Taurus the Bull. I would but our adorable modes don’t overlap.